PTFE Stampings | Boker's, Inc.
Boker’s is a stamping manufacturer of PTFE products and components. Polytetrafluoroethylene (PTFE) is a synthetic fluoropolymer of tetrafluoroethylene that finds numerous useful applications. PTFE has one of the lowest coefficients of friction against any solid. It is also very non-reactive and therefore often used in applications with reactive or corrosive chemicals. 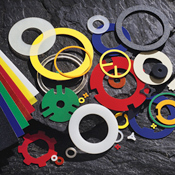 Boker’s has the capabilities to manufacture your most complex PTFE stampings in a range of sizes up to 12” x 12” (flat) with thicknesses from .005” to .125”. To obtain a quote on your next PTFE stamping project fill out Boker’s fast quote form and submit with your production prints.